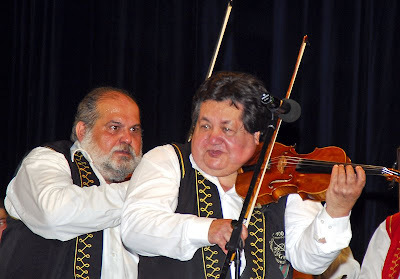 I went to a concert tonight at the House of Traditions performed by the Budapest Gypsy Symphony Orchestra. 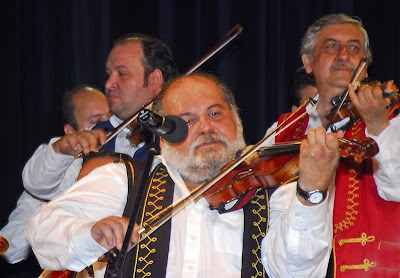 This world famous orchestra is also known as the Orchestra of a 100 Violins – but there were far fewer tonight, so maybe this was a sort of cut-down performance given that the stage of the House of Traditions wouldn’t accommodate many more than about 50 musicians. 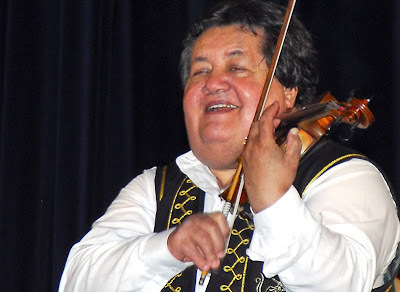 I was intrigued that in the middle of the orchestra there was a female violinist dressed in a long black evening dress – whereas all the other musicians were wearing traditional gypsy attire. 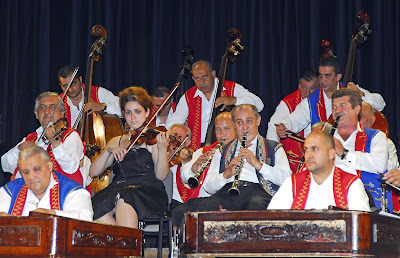 It wasn’t because only the men were wearing the traditional clothes because there was one other female musician on a viola who was wearing the same traditional dress. It sort of looked like the woman in the black dress had got dressed for the wrong concert! Even though the orchestra was ‘cut-down’ for this performance, it still featured some of its top musicians including Oszkár Ökrös, who is reputed to be the best cimbalom player in the world (and a very big man at that). He certainly worked up a sweat for his solo pieces (see picture below). 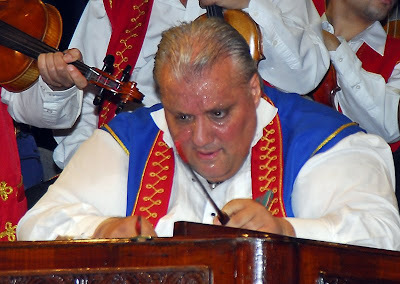 The orchestra was led by Sándor Rigó Buffó and Lendvai Csócsi József (pictured below). They too worked up a sweat in one of their ‘duets’ (not sure if that is what you call a performance by two violinists). Lendvai Csócsi József (below) led the orchestra for most of the performance. His position is officially Leader of the Orchestra. But for part of the time it was led by Sándor Rigó Buffó (below) who is also the President and Artistic Director of the orchestra. I guess that was to give Lendvai a rest. Lendvai’s a big man as well and he looked like he needed it. I wonder why these virtuosos are such big men? I enjoyed the performance because it was live. It’s not the sort of music that I would download to my iPod though. (That reminds me, I came across a great album by Chantal Kreviazuk the other day called ‘Colour Moving and Still.’ I downloaded five tracks from the iTunes store – I love the combination of acoustic and electric guitars on the track called ‘Blue.’ I was listening to it over and over again on the plane coming over).